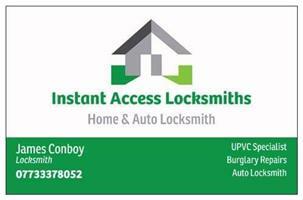 Instant Access Locksmiths - Locksmith, Windows/Doors/Conservatories based in Solihull, West Midlands. Thank you for visiting my Checkatrade page. I am an experienced locksmith, having been in this industry for over 10 years. I cover Solihull and surrounding areas including Redditch, Sutton Coldfield and Bromsgrove. My entry methods include a selection of tools which are non-destructive giving you peace of mind for your home or vehicle. All work is guaranteed in writing, call today to see how I can help you at a competitive price.